Plants have been used since ancient times to heal and cure diseases and to improve health and wellbeing. Despite ancient nature of the tradition, medicinal plants still form the basis of traditional or indigenous health systems and are reported by the World Health Organization (WHO) to still be used by the majority of the populations in most developing countries. Medicinal and aromatic plants (MAPs) play a significant role in meeting the demands of the traditional medicine markets which are found both domestically in the producing and in overseas markets. Traditional medicine, for example, which is related to traditional Chinese medicine (TCM), Indian ayurveda and Arabic unani medicine and to various forms of indigenous medicine, as well as the complementary or alternative medicine utilized in industrialized countries, is achieving growing credibility in many parts of the world. The percentage of people using traditional medicines decreases in developed countries: 40-50 percent in Germany , 42 percent in the USA , 48 percent in Australia and 49 percent in France . The last three decades have seen substantial growth in herb and herbal product markets across the world. Rapidly rising exports of medicinal plants during the past decade attests to worldwide interest in these products as well as in traditional health systems. According to the Secretariat of the Convention on Biological Diversity, global sales of herbal products totalled an estimated US$60 000 million in 2002 . At present, 80 percent of the population in developing countries rely largely on plant-based drugs for their health care needs, and the WHO has estimated that in coming decades a similar percentage of the world population may well rely on plant-based medicines. Thirty percent of the drugs sold worldwide contain compounds derived from plant material. As a result of the expanding interest in medicinal and aromatic plants, new income-generating opportunities are opening up for rural populations. With many of the MAPs gathered from the wild, the collection and sale of MAPs is providing a complementary source of cash for many extremely poor rural households. However, despite the fact that the products collected can have very high value in the final products, the collectors typically receive only a small share of the final value, either because they are unaware of the real value, are unable to market it in the form wanted by buyers or are unable to market to these buyers. TITZ A. 2004. 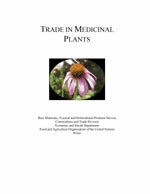 Medicinal Herbs and Plants – Scope for Diversified and Sustainable Extraction. 22-26 July 2004, Bangalore . WHO. 2003. WHO guidelines on good agricultural and collection practices (GACP) for medicinal plants , p. 1. Geneva .